Especially designed to work on soft plastic lures, Spike It's strong and reliable Fix-A-Lure glue will get your lure back together and keep it together. 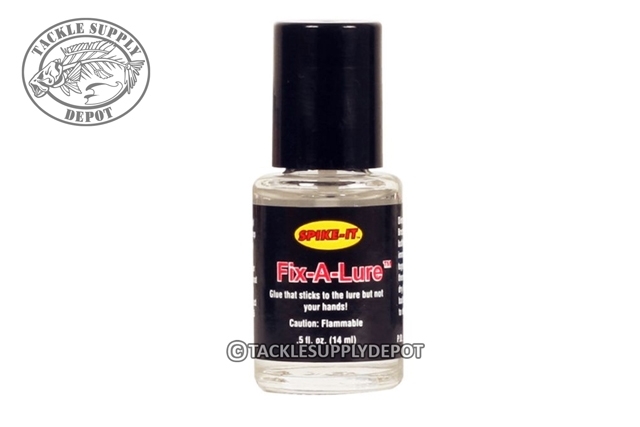 Not only will Spike-It's glue have your lure as good as new, it won't stick to your hands. Fix-A-Lure is also great for designing and customizing your own unique lures. Try gluing a new tail to an existing lure or adding a 3-D eye to a plastic minnow. With Fix-A-Lure the possibilities are endless. Spike It's bottle is conveniently designed with a brush applicator which allows for precise applications to your lure and prevents the glue from drying out. Glue That Sticks to the Lure, But Not Your Hands.